The quality of mobile gaming is definitely improving, but some of us are old enough to remember the excitement that Nintendo’s original Entertainment System (NES) and Game Boy brought into our lives. 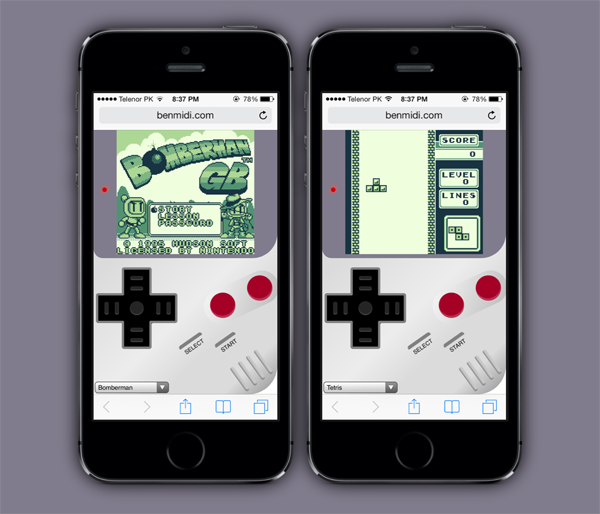 We’ve seen emulators galore being released over the last few weeks that bring the pleasure of the old school Nintendo experience to our iOS and Android devices, meaning that it shouldn’t really come as a shock that a new Game Boy emulator from Ben Midi has appeared for iOS, Android and Windows users. Midi’s Gameboy creation is very similar to webNES that we wrote about last week. The emulation experience is handled entirely from within the mobile browser on the device in question, making it quick and simple to get up and running with. This user-experience differs significantly from offerings like the popular GBA4iOS that requires additional downloads to happen before it will actually function. Gameboy also attempts to stay true to the original physical stylings of the iconic Nintendo Game Boy by featuring a Web based interface that looks exactly like the old hardware. In an effort to make things easier for the user, and to minimize the amount of time it takes to get up and running with some old school gaming action, Midi appears to be hosting thirteen classic games that can be played immediately. This removes the need for gamers to go and source their own game ROMs and upload them to the relevant directory to make them available to the emulator. Yet another plus point over various jailbreak solutions that we have seen in the past. Mario Land, Tetris, Dr. Mario, Space Invaders, Bomb Jack, Centipede and Motorcross Maniacs are just a few of the classic titles available. Giving this level of access to the games, and hosting them directly, does raise the question as to whether or not Nintendo will act quickly to get their legal team involved to provide a cease and desist warning. With that said, it’s unlikely that fans of the old school Nintendo experience will worry too much about that as they attempt to relive their youth by dedicating countless hours to Mario Land. At the time of writing, we tried the emulator on a wide range of platforms and it works flawlessly! Ranging from iOS devices, Android smartphones and tablets, a Surface RT and even a notebook PC. It just works! Play Nintendo Games In Web Browser On iPhone And Android, Here’s How!